Bobbi Brown became one of my first high-end make-up items, when I was a teenager and my Aunty bought me a Bobbie Brown Shimmer Brick as a Christmas present – MAJOR brownie points for Aunty. Ever since then I’ve always had a bit of thing for all things Bobbi (and I still have that shimmer brick). A gorgeous silver and gold highlighter palette with party-worthy design. Inside there are two lip shades and a lip gloss. There’s also a small mirror in the lid and the lipgloss slots in nicely so it’s easy to carry. 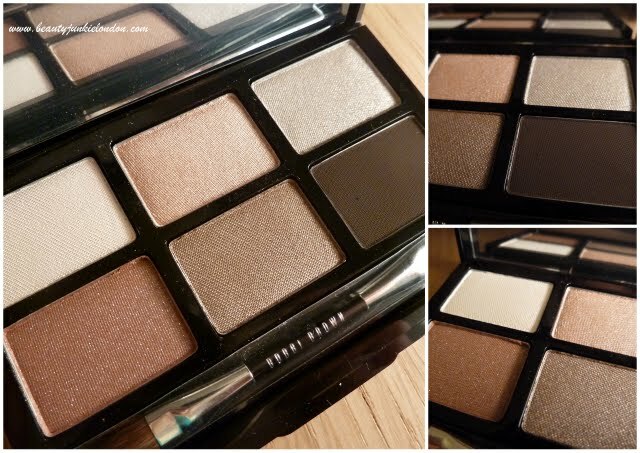 A gorgeous neutrals palette – very slim and nicely portable. Swatches of the black and silver liner – the black is lovely and glossy. The little portable palette is amazing for it’s size – very pretty colours (I like that it’s purple shades of eye-shadow rather than typical smoky grey) and the lip colours are nice but a bit on the dark side for me. How amazing would it be if you could pick and mix a palette that was that size!? Will report back again with swatches! Wow – I’m loving the compact palette!! These are the kind of posts that I wish my husband would read. Mary Quant actually does very interesting make-up, with amazing packaging. They do pallettes where you can mix and match lipsticks (in different textures as well as a good shade variety)and eyeshadows. I gave one to a friend and it was definitely a gift to give proudly. I don’t represent Mary Quant, I just love the idea of an iconic English brand from 60s London.